An EHCP or Education, Health and Care Plan is a wondrous affair where a person with special needs has all of their difficulties and challenges outlined in one easy to read document. This document is then shared to all three specialties; education, health and social care who professionally argue to be allowed to demonstrate that they can best help meet these young person’s needs, allowing the young person to achieve their full potential and develop skills to be able to have a full and meaningful life. Sounds wonderful; sadly far from the truth. EHCP day is the culmination of the last 3 months of assessments from various, previously unmet professionals. The professional comes to the house, stays for no more than two hours to observe or question both Dylan and ourselves and then they leave. Following this brief encounter a report is produced and sent to the special educational needs (SEN) department. If we are lucky then as parents we are copied into this correspondence. If not, then the leg work of chasing this up begins. The document itself is made up of various elements which should work in a reactive chain. The first part of the document outlines needs. This part is complied by the SEN officer who reads the various assessments and ‘cuts and pastes’ these into a document. The ehcp is a new document and a new process which involves the young person and the families more than the previous ‘statement of educational needs’ document that it supersedes. The truth is that Dylan’s new EHCP draft document is his previous statement with small more recent elements added. It still refers to when he was at school. HE LEFT FIVE YEARS AGO? This first part of the document outlining needs is then used to construct some targets for the following year. These targets should be SMART and individualised to Dylan’s needs, like little building blocks, these targets can be used to work towards a bigger target over the coming years. Then the next section is the provision section. What extra help is it that Dylan needs to be able to meet the targets and who’s going to provide them? So it’s a clear flowing process where Dylan’s needs are key and the document flows to devise a plan of support with these. A fundamental flaw to this process is that the inital compiling of the information and identification of Dylan’s needs is completed by a SEN officer from the local council; the same council which provides or commissions the support. As a legally binding document it must match support to identified needs. However if the department doesn’t have the funds or the provision to be provided in the third section chances are those needs will be over looked, tweakef or omitted in the first section to make it look like a worthy document. If they don’t mention the need then they can’t be expected to provide for it. Well that’s not fair! For instance in Dylan’s needs assessment the use of the iPad for him to communicate is mentioned a total of four times within the needs descriptor along with how impossible it is to understand him verbally. Scan through to the provision section and speech therapy support this year is being reduced from 15 hours a year to three visits with no mention of the iPad. Not only is this a huge drop in support but the provision is being outlined before the needs section has even been discussed. 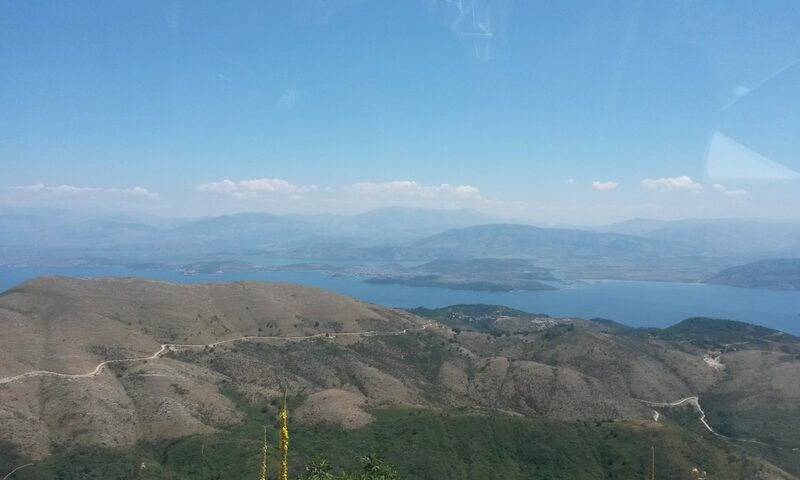 The EHCP, like the statement before it, is a provision led exercise rather than needs led support system. When the prepopulated document is produced it is circulated to all who contributed with a meeting invite. This meeting is supposed to be to discuss a representation of needs and for the the provision to be agreed. The reality is that Dad and I go to meet with 1-2 of the professionals who have contributed to the assessment process (as most of them don’t turn up anyway). We then disagree with the needs section as its out of date but have to use the piles of dogeared highlighted documents that were produced in the assessment process to demonstrate why Dylan’s documented needs should be changed. Its not just a simple request. Sometimes you can convince the SEN officer to change or amend the needs section. Others not. After all, she wrote the needs section in the first place! 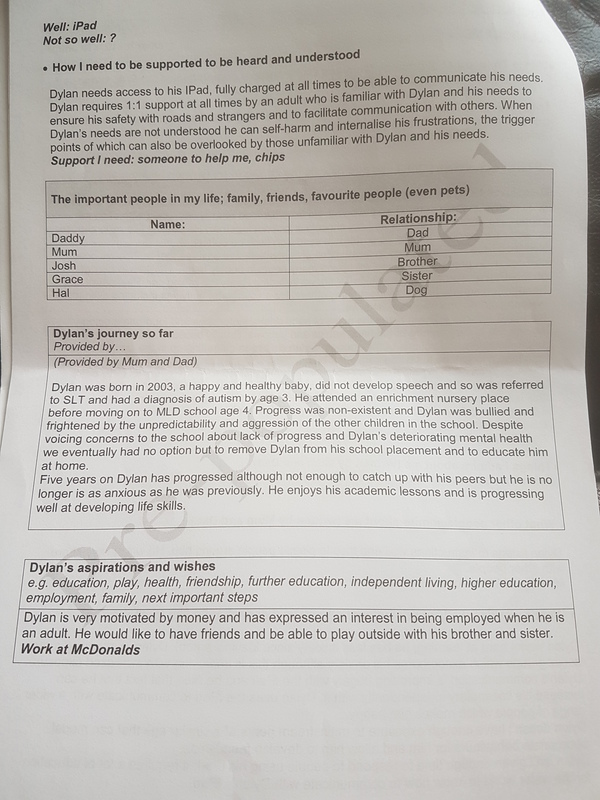 Dylan’s aba consultant and Miss E are not allowed to have reports considered for this as they do not provide county provision, even though they do provide provision for Dylan. Again, this is a provision led rather than Dylan led process. And so it goes on. Once the needs section is completed we continue to move onto the targets and each speciality worker should contribute to how their assessment demonstrates the support Dylan needs to access learning and achieve some targets. But with only a handful of professionals present it falls to Dad and I to fight Dylan’s corner to have some decent targets for the coming year. Before when I wasn’t as informed about this process as I am now, we weren’t even invited to the meetings and it was all held within the school. 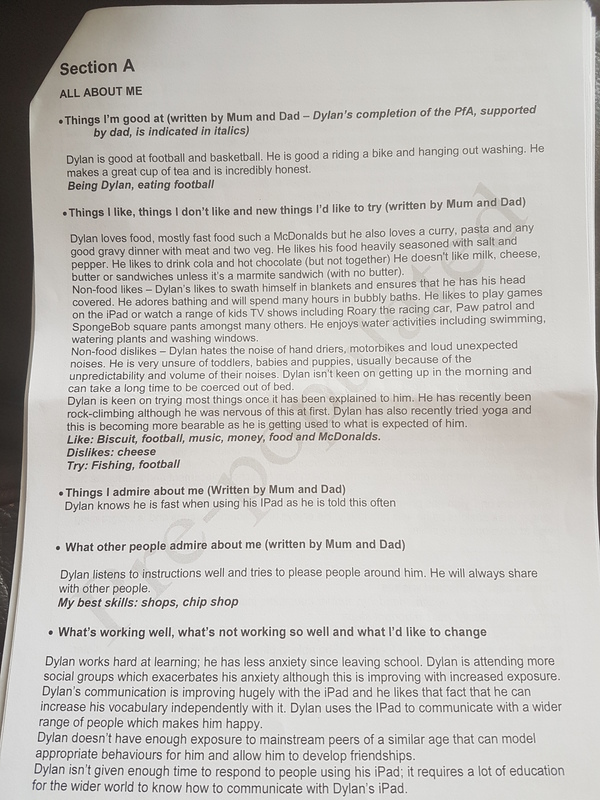 A favourite yearly target of mine from the statement document when Dylan was about 7 was ‘to be able to mix cooking ingredients with his hands’. We removed him from school soon afterwards…. So my mission for this morning. To have the iPad documented in the provision section so if it breaks or needs replacing this should be covered by his ehcp and not down to us to replace. Dylan needd his iPad to communicate. Dylan also needs access to an AAC environment where he can have specialist support on developing his communication skills and feel that he belongs to a community of AAC users. Dylan can’t communicate so he cannot have his speech provision reduced. Absolutely not. 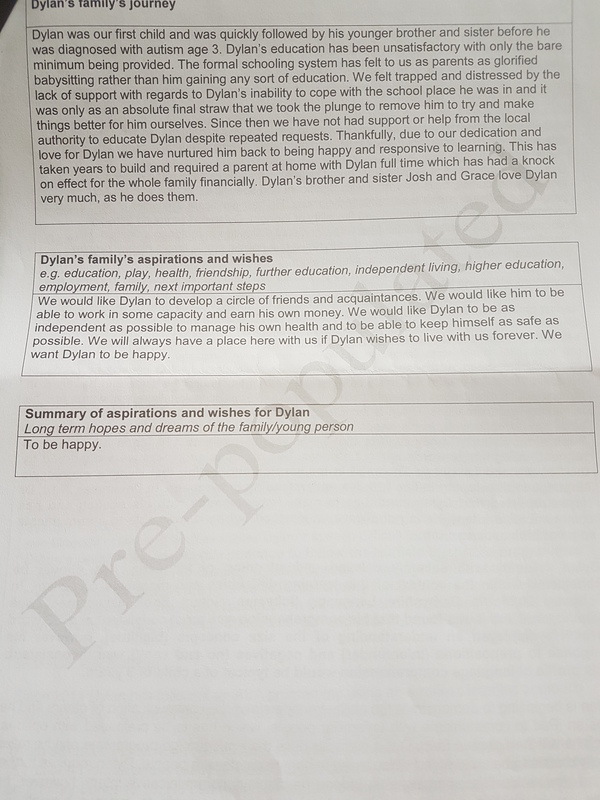 Even though the 15 hours from last year only actually materialised into 4 hours (which is illegal) and the standard of therapy is so low that we privately source Miss E. It must be recorded that Dylan has these needs and this is the provision required to meet them; regardless of who provides it. Dylan needs more social opportunities. We want a college place for him. After a wonderful visit to the college yesterday which Dylan thoroughly enjoyed he needs to be able to access a specialist educational placement. Only a day a week to be able to get used to a new setting to then be able to go full time by 2019. The only difference between the statement and the EHCP is that Dylan is asked to contribute to it. We took full advantage of this. The bank of questions used once again shows how unindividualised the whole process is. I love the ‘glorified babysitting’ line on our family statement that they have to accept as part of our evidence. Not a truer word. Well I’ve got my big pants on; wish us luck!